As Atlanta commercial roof professionals we know it’s easy to forget about your roof; after all, out of sight, out of mind! 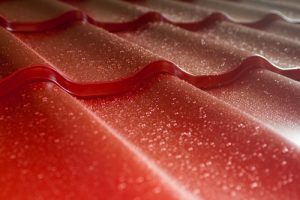 While you may think a metal roof has fewer worries than other types of roofing systems, there are some anomalies that should spark concern. Find out what they are below! Punctures from heavy foot traffic on the roof, bent or crimped panels, rust, issues with fasteners, metals that don’t work well together or are incompatible – there are a lot of things that can lead to problems when you don’t keep track of having your metal commercial roof inspected regularly. If you have it inspected by skilled, knowledgeable professionals about twice each year, it’s usually possible to take care of the issues before they become larger, more expensive problems. Why replace before you have to? It’s often possible to restore or repair when you catch any problems from the beginning. As they say, an ounce of prevention is worth a pound of cure! All of the things we mentioned above (surface rust, fastener issues, crimped panels, incompatible metals) can eventually cause water leaks. As a business owner you already know water is a building’s worst enemy, but you can’t stop the rain. The best you can do is to take the necessary precautions to protect your structure’s integrity. Metal roofs often are superior in terms of good water flow and protection of your building, however it’s vital to make certain there aren’t any issues that are causing water to stand or pond on your roof for a substantial time. Monitor your roof closely for rust, inspect on a regular basis for punctures, crimped panels or problems with fasteners, and always be sure to have professionals perform regular maintenance inspections. A metal roof is a very smart investment, but you still have to protect it and not put it completely out of your mind. For all of your commercial roofing needs in Atlanta, trust the experts at Kelco Roofing.